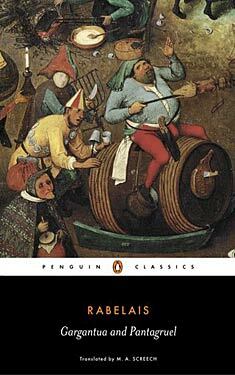 Parodying everyone from classic authors to his own contemporaries, the dazzling and exuberant stories of Rabelais expose human follies with mischievous and often obscene humor. Gargantua depicts a young giant who becomes a cultured Christian knight. Pantagruel portrays Gargantua's bookish son who becomes a Renaissance Socrates, divinely guided by wisdom and by his idiotic, self-loving companion, Panurge. Gargantua and Pantagruel was originally published in five parts, with the first part having been published in 1532 and the fifth and final part having been published in 1564.